Success in project management is like a three-legged stool. The first leg is the project manager, the second leg is the line manager, and the third leg is senior management. If any of the three legs fail, then even delicate balancing may not prevent the stool from toppling down. 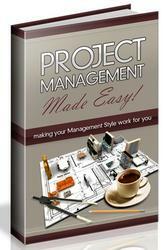 The critical node in project management is the project manager-line manager interface. At this interface, the project and line managers must view each other as equals and be willing to share authority, responsibility, and accountability. 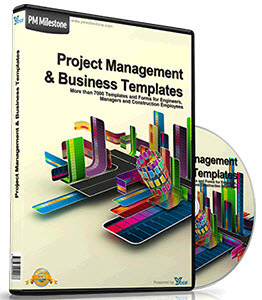 In excellently managed companies, project managers do not negotiate for resources but simply ask for the line manager's commitment to executing his portion of the work within time, cost, and performance. Therefore, in excellent companies, it should not matter who the line manager assigns as long as the line manager lives up to his commitments. Since the project and line managers are "equals," senior management involvement is necessary to provide advice and guidance to the project manager, as well as to provide encouragement to the line managers to keep their promises. When executives act in this capacity, they assume the role of project sponsors, as shown in Figure 1-5,4 which also shows that sponsorship need not always be at the executive levels. The exact person appointed as the project sponsor is based on the dollar value of the project, the priority of the project, and who the customer is. 2 The expectations are discussed in Section 9.3. 3 The role of the project sponsor is discussed in Section 10.1. 4 Section 10.1 describes the role of the project sponsor in more depth. Figure 1-5. The project sponsor interface. 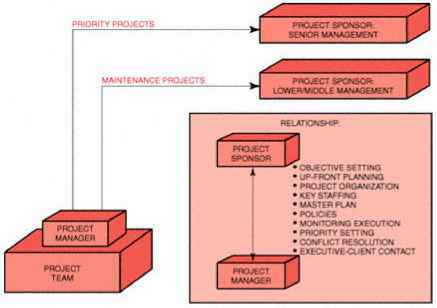 The ultimate objective of the project sponsor is to provide behind-the-scenes assistance to project personnel for projects both "internal" to the company, as well as "external," as shown in Figure 1-5. Projects can still be successful without this commitment and support, as long as all work flows smoothly. But in time of crisis, having a ''big brother" available as a possible sounding board will surely help. When an executive is required to act as a project sponsor, then the executive has the responsibility to make effective and timely project decisions. To accomplish this, the executive needs timely, accurate, and complete data for such decisions. The project manager must be made to realize that keeping management informed serves this purpose, and that the all-too-common practice of "stonewalling" will prevent an executive from making effective decisions related to the project.